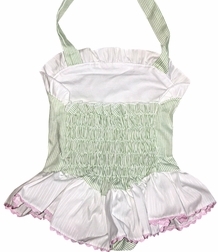 Here we have our adorable soft green 1 piece swimsuit bathing suit for little girls. The swimsuit has white ruffles around the neck and arm holes and a larger ruffle around the waist. 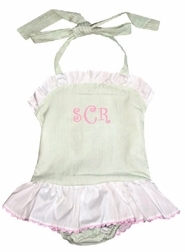 The waist ruffle is trimmed in light pink ric rac. The suit is fully lined and is just perfect for either a white or light pink monogram. The swimsuit ties at the neck and has an elastic back for better fit.